In addition to the name Bloodflower, this species is also known as Tropical Milkweed, Mexican Butterfly Weed and Bright Wings. Whereas some forms of the species -- such as Orange Bloodflower -- have bicolor red-orange and gold blossoms, this one is a long-blooming bright yellow. Golden Bloodflower does well in a variety of average garden soils, requires full sun and -- similar to other forms of the species -- tolerates heat. Although it loves ample water, average watering based on local conditions is sufficient. 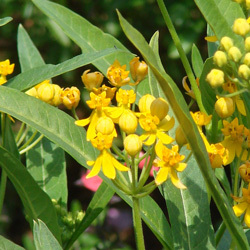 The plant's medium-tall height makes it a good choice for middle locations in borders and flowerbeds. Monarchs lay their eggs on the lance-shaped leaves of milkweeds -- the only plants their caterpillars will eat. The roughness of fuzzy milkweed foliage makes it easier for eggs and chrysalises to cling to the plants. Monarch caterpillars consume powerful chemicals in the leaves protecting them as babies and adults against predators for whom the chemicals are toxic. 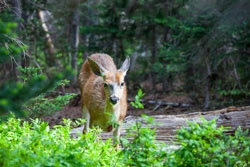 Perhaps it is these chemicals that make deer avoid the plant. 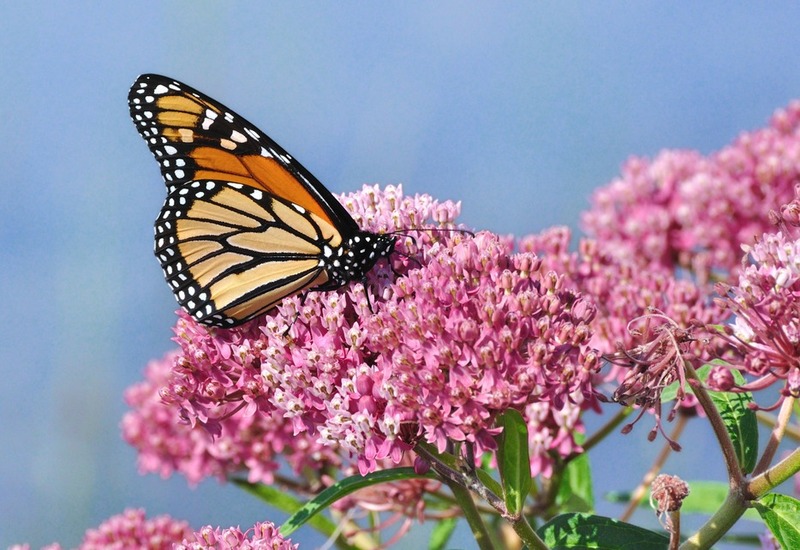 In the past few years, much has been written about the problems as well as the benefits that Tropical Milkweeds present for Monarch butterflies. Butterflies adore these lush bloomers, which offer plentiful nectar and provide what is becoming scarce -- lodging for Monarch larvae. 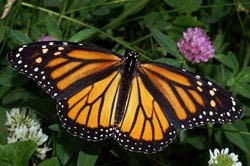 However, where these plants persist outdoors during winter, Monarchs may not complete their migration to Mexico. 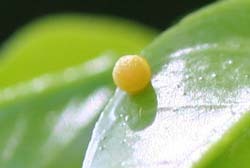 Prolonged growth and flowering creates difficulties including the spread of a protozoan parasite that harms Monarchs. 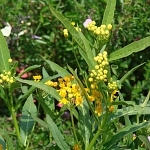 To avoid this problem in warm regions, cut all types of Tropical Milkweed to the ground during early autumn and winter. To overwinter Golden Bloodflower in areas with cold winters, you can cut the plant back before it loses its foliage and then transplant it to a container for storage indoors in a cool, sunny location.